Hat and shoes, Topshop. Two piece, Missguided. Cardigan, New Look. Well it's not exactly sandal weather but when you ain't leaving the house much in one day then why not wear sandals. Thought I would share this Missguided two piece which I have got such good use out of. For smart occasions and for casual occasions. I think everyone needs a good co-ord in their life. I know that I need many more. So easy to wear and so Kim K( I just said that didn't I?) I relate to Kardashians style though. Her motto is 'less is more' and that's mine. She does not over do accessories and she is a lover of two pieces and simpleness. I don't agree with her shoe choices - strappy heels don't do it for me, for example the ones she wore this weekend for the London event. But yeh I kinda like her, she doesn't quite top the Olsen's though - I have a whole Pinterest board dedicated to them. we're obsessed with this look!! 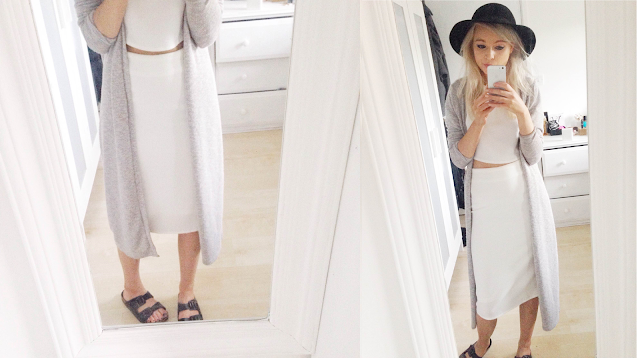 we've been loving the white on white trend at the moment, and you've done a marvellous job at pulling it off. Genius styling!